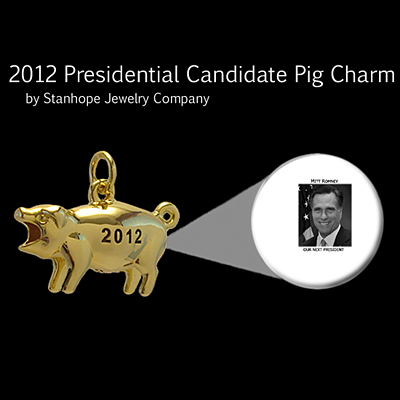 Political Pig charm with stanhope photo of 2012 Presidential Candidate Mitt Romney. Just look in the pig's rear end to see the crystal clear image of "Our Next President"! 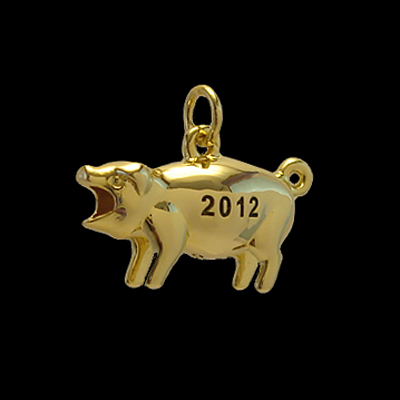 This year for the first time our pigs are embellished with '2012' for the election year. The pigs are a great gift item for just about anybody. 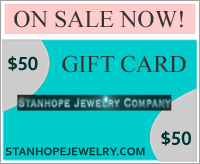 They make a wonderful key ring pendant or wear it as a necklace on a chain. They also fabulous on charm bracelets or used as a watchfob. Beautifully polished rich gold plated finish. Don't wait, collect them all! These pigs are sure to become collectors' items as they are made in very limited quantities, especially those who are less popular candidates. HISTORY FACT: Did you know the political pigs were common during 1872 through 1912 for both Repulican and Democratic presidential nominees. Often times the pigs were referred to as 'learned' pigs, since all one had to do was peep inside the pig's rear end to see the pig's predicted presidential winner. These early political pigs are now highly sought after by collectors and most often fetch prices from $300 to $1,000 per pig depending on the image. They ceased to exist after McKinley and were not again made until 2008.